As part of 'a $1 million project to improve the credibility of newspapers and journalism,' the American Society of Newspaper Editors commissioned a poll of 3,000 Americans in April and May of 1998. 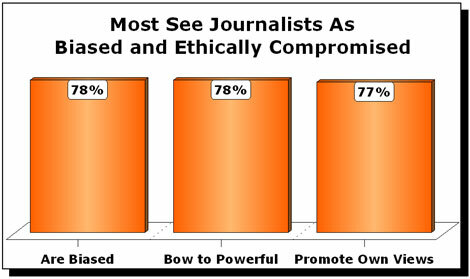 The survey found that more than three-fourths of Americans (78%) believed that the press is biased, and an equal percentage believed that reporters would 'spike or spin' a story to suit powerful interests. The findings were detailed in a 1999 report, Examining Our Credibility: Perspectives of the Public and the Press. '78 percent of U.S. adults agree with the assessment that there is bias in the news media,' the report found. 'Although a sizeable portion of the public (46 percent) thinks that their newspaper is more liberal than they, another significant segment (36 percent) see the newspaper as more conservative than themselves,' ASNE found.